Whenever I deliver a fitness seminar or wellness workshop I rarely prepare a lecture anymore. Rather I have found over the years that as long as someone asks one good question it causes a chain of questions and answers from which people really learn something. There is something special about the dialectic process (at least Socrates thought so) which is very different from passively receiving monologues. So please ask any questions you may have and lets see where it goes from there. 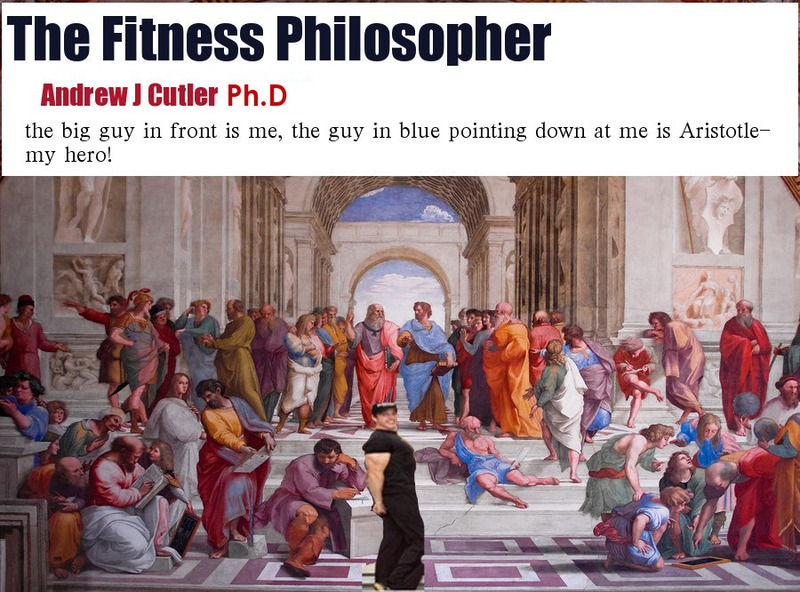 i'm excited to keep up with this blog...philosophy and fitness information: great combo! Looks good so far...I check it everyday! Thanks Marty-any questions? fire away! When I did my MED I did some readings into early "teachers", so some of this is familiar, certianly not to your depths, but still, I could read it all day! So, I just re read you posting...let me ask this. Having just returned to the gym to lift, I am currently working under the idea of lifting every set to failure (after an appropriate warmup). Decent results in only 3 weeks...any words of caution? All depends on your goals! Sounds like you have the Mentzer/Yates/Jones bug and are attempting a version of High Intensity Training-it generally works great for 3-4 weeks. As long as you are only doing 1-2 work sets you can push to failure. BUT failure has a range. Failure of the positive movement is first, then a static hold and when that fails a slow negative, then a partner can re-lift and do multiple negatives. But everything depends on your goals. So positive failure for 1-2 work sets is okay as long as you have long rest periods/days off. BUT going to total muscular failure on every set of every workout will only lead to burnout of the nerves and mind! That is of course a general answer, all forms of training have their place in the right context. What are your goals and experience with weights Marty? just did 2 weeks of light weights to get warmed up and work on good form. Thought I would do 4 weeks of 2 warm up, 2 to fail just to really jump start the system. I prefer to lift for strength, not size/definition...size interfers with my golf :) It would be at this point that I would need some guidance...your phone will ring! For strength for sports, I like low rep work and mobility training. If you ever want to train in person I am in Fredericton, Canada but if you are not local I can always email you a program. But please ask as many questions as you like. and in addition VIP transportation service. Call now and chat with one of our medical professionals.